Ernie's great great nephew, Stephen Davies, is SO proud to be able to be a pall bearer for his great great uncle's coffin. His wife, Esther, is the Sunday School teacher, and she is also already in church helping with the children as they are all needing special support and comfort on this difficult day. Stephen is proud to be wearing the outfit he wore at his wedding. He remembers how much his great great Uncle Ernie loved him in it on his and Esther's wedding day! It seems the right thing to do to wear it for this, his great great Uncle Ernie's final farewell. 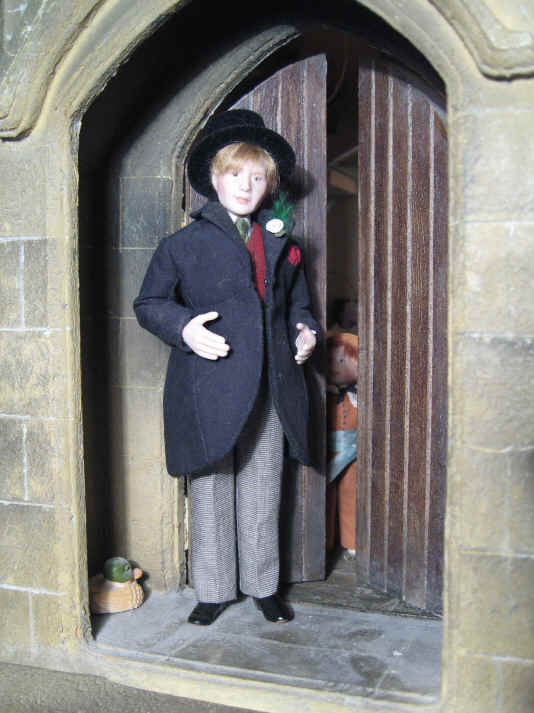 He is waiting patiently at the door for the hearse with the coffin to arrive. Ambrose and Tom are making themselves busy. They are carrying the trestles which the coffin will stand on whilst it is in church during the thanksgiving service. Esther has brought along a family heirloom of Stephen's especially for the occasion. 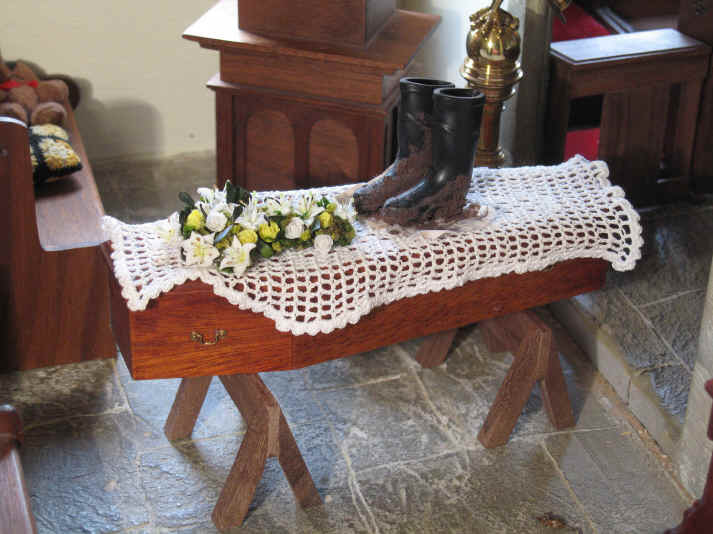 It is a hand crocheted coffin cover which was crocheted for family funerals back in Victorian times. Tom is MOST impressed because, although it is VERY old in his eyes, it is also VERY clean and white. Stephen's family have taken great care of it to keep it looking so clean and white! Magnifi-Cat and Tinker are also MOST impressed and Tinker is not happy until she has had a little dab at it too. 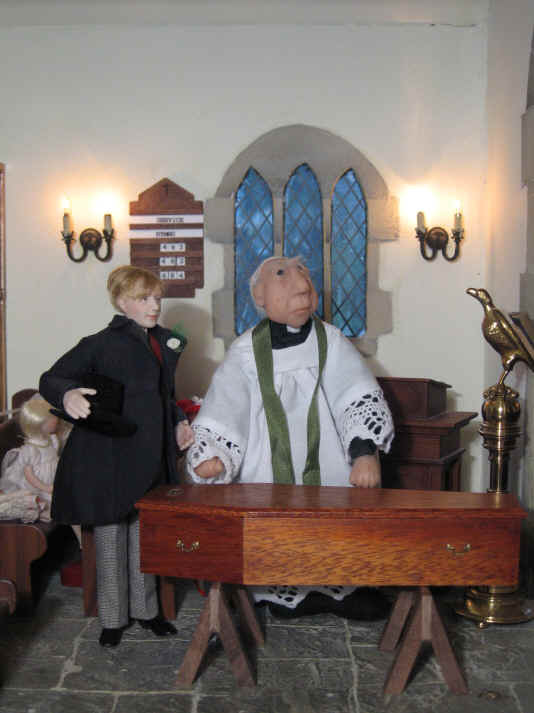 Stephen, together with the other pall bearers, has now brought the coffin of dear Ernie into church and set it on the trestles. Esther is very careful to lay the coffin cover on to Ernie's coffin correctly. She spent ages last night ironing it! Ambrose is going to place the family wreath on to the coffin. Stephen and his family wanted to have a cross made up of white lilies with lemon and white roses. Doesn't it look beautiful! Ernie never married so he had no children. Stephen and his family are his next of kin. 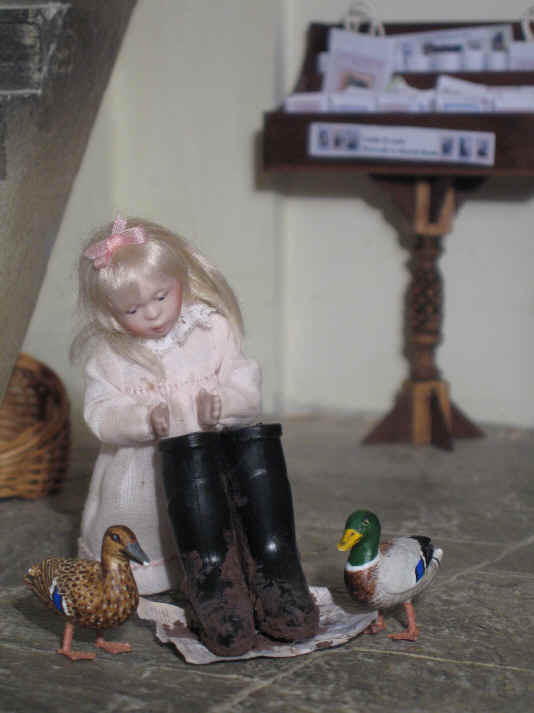 Priscilla Jane together with Esme and Ernest, noticed that Ernie had left his muddy wellies outside the church door. Ernie was always SO careful NEVER to tread mud into the church! 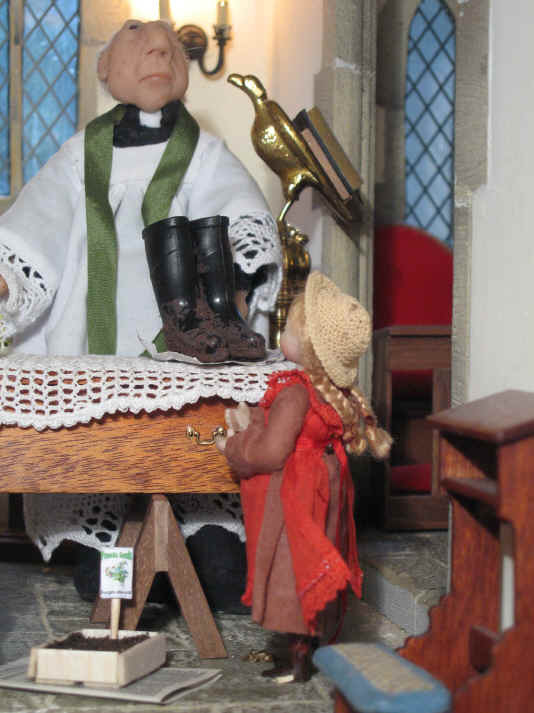 Priscilla Jane has brought the muddy boots into church.......but when she realised that the mud was still wet because it had been raining outside she found some old newspaper to put them on. Suddenly Priscilla Jane has a really brilliant idea.......AND she thinks that Ernie, if he was there, would approve of it. Ahhhhhhhh........THAT is what Adele and Prisiclla Jane wanted to do! We hope that the vicar and Stephen's family approve of this! Adele has put the muddy boots, whilst still on the paper, ON to the coffin next to the beautiful cross wreath from Ernie's family. Priscilla Jane so wanted to plant something special in memory of dear Ernie she has brought the seed tray along so that it too can be put on the coffin. Can you see which flowers she has chosen to plant? "Forget me nots" are SO appropriate aren't they? 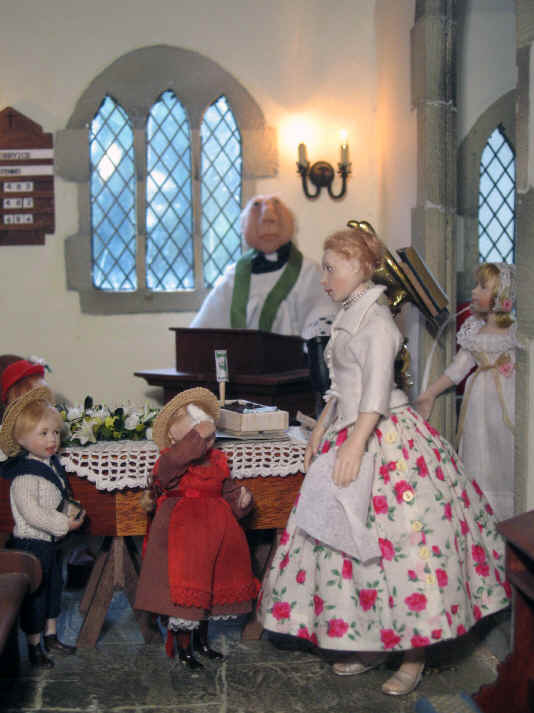 EVERY time the children see them in the churchyard they will ALWAYS remember dear Ernie. AND they were one of his favourite flowers together with the Marigolds. She wonders if Ernie can see these tributes as he is now in heaven. Adele has moved the wellies along to make sure that they leave room for the seed tray! Goodness - Ernie would be so thrilled to see his coffin decorated so beautifully! The children KNEW him so well didn't they? 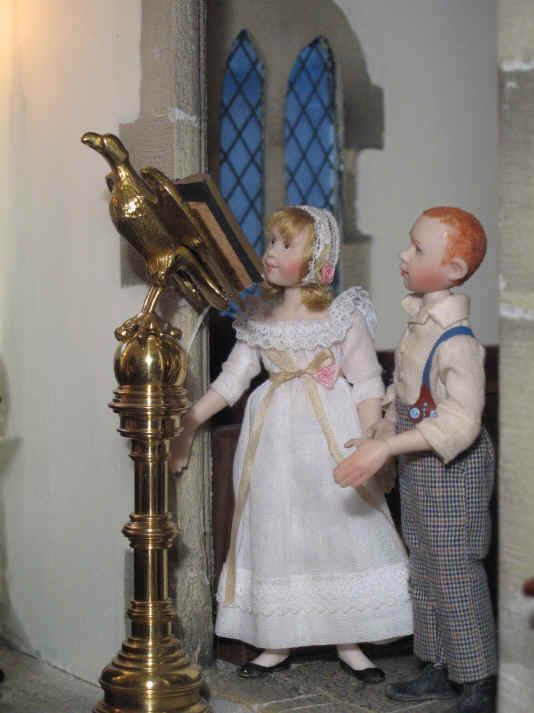 Alice AND Ambrose are sharing the reading which is taken from John's Gospel.
. They know that one may break down and cry whilst trying to read so the vicar said they can both share it! Phoebe is helping Miss Enid by turning her pages for her...............it also helps her not to cry because she has to keep watch all the time to ensure that she turns the pages at the right time! This is an extra special service for Miss Enid. It is the very FIRST proper service she has played for in St. Hilary's. 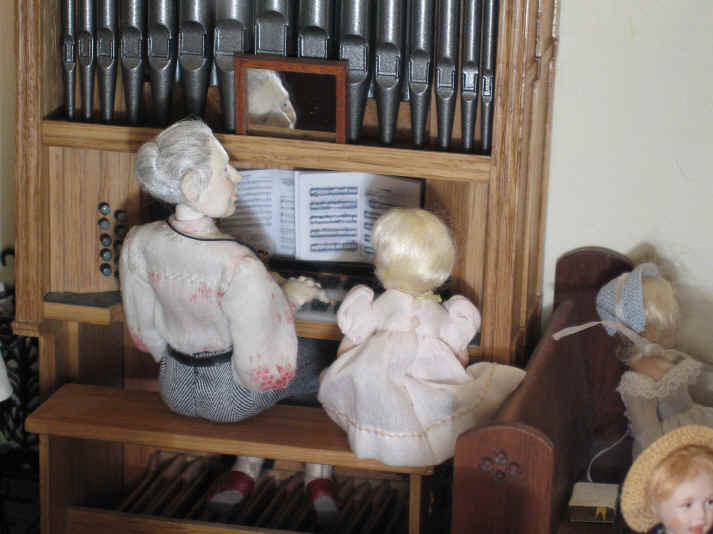 Miss Enid is also pleased to have Phoebe by her side as she knows she is such a musical girl she will make sure she doesn't go wrong! Who has also come into church to pay his respects to Ernie? It is Homer. Ernie used to invite Homer around for dinner when he was hungry and when it was cold in the Winter. 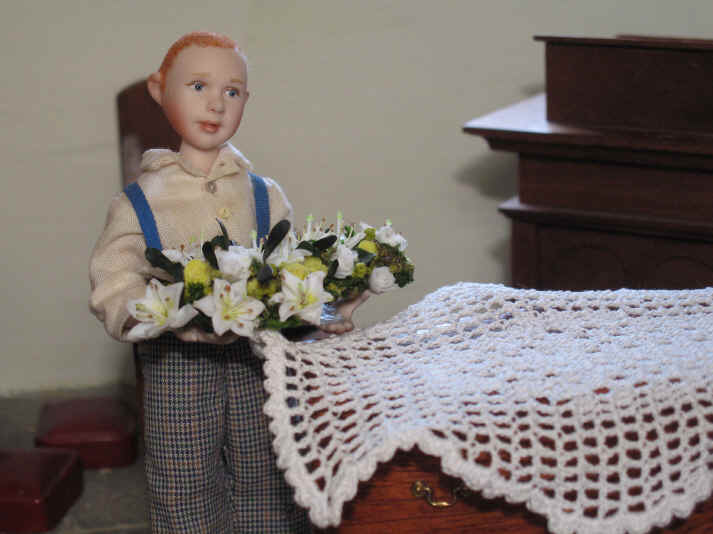 Ernie was such a kind and gentle man that all in St. Hilary's and Daffodil Green loved him. 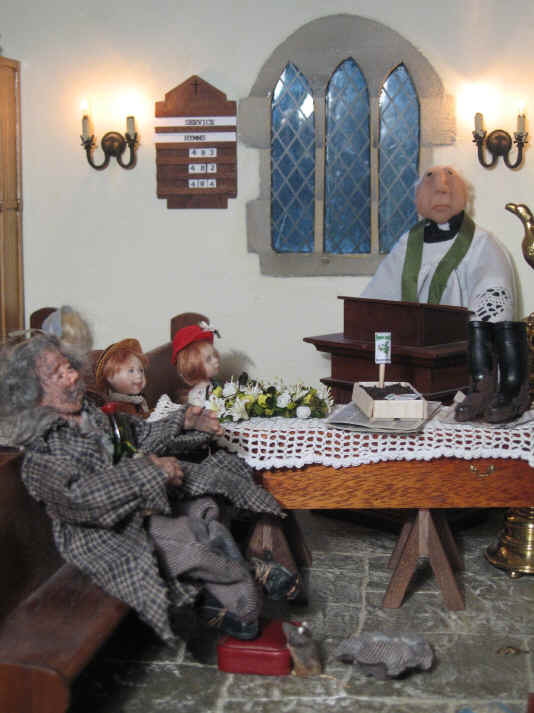 The vicar is talking to them about Ernie and about the Bible reading they have heard read by both Alice and Ambrose. Ben wants to know if Ernie will be able to be a gardener in heaven because he preferred to be outside. He was worried because in the Bible reading Jesus only mentions rooms and not gardens. The vicar reassures the children that there is a place in God House in heaven for everyone who loves Jesus as much as Ernie did...EVEN a beautiful garden! Priscilla Jane is thrilled to lead the prayers for Ernie. 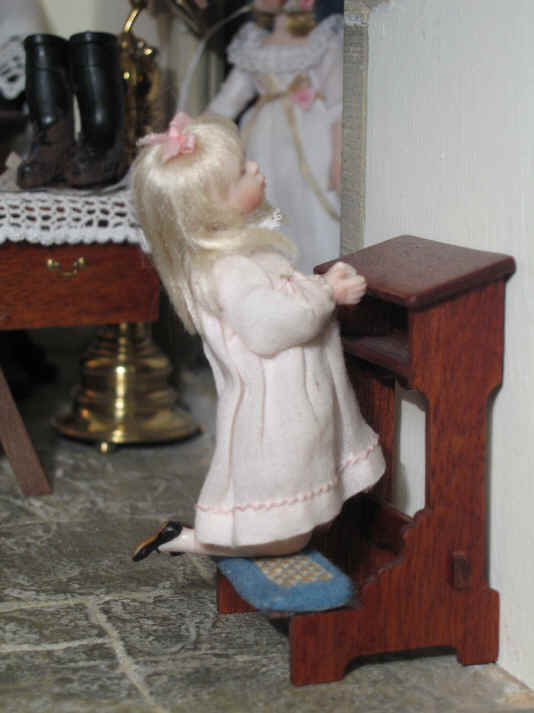 She loves to pray whilst kneeling at the prayer desk in the church Prayer Corner. 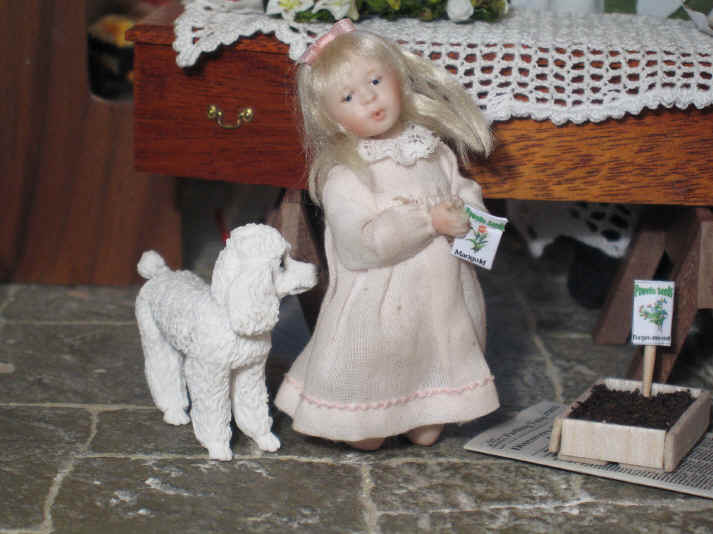 She asks God to bless them all and help them as they learn to live without Ernie in their lives. The children KNOW that Ernie is now much happier because he no longer has to suffer his arthritis and that he can do lots of gardening in heaven without all of that pain! Oh dear..........it is ALL too much for Adele...........isn't it good that Esther remembered to bring LOADS of tissues to church for the children and congregation too. 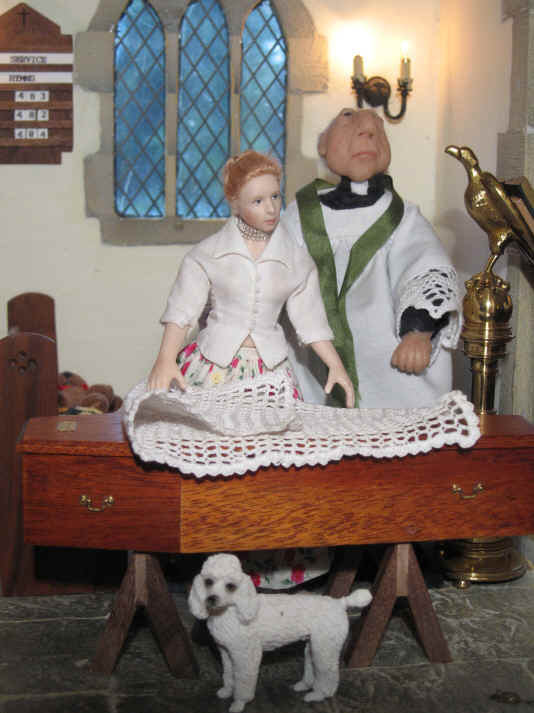 She knew that the thanksgiving service would be really upsetting for everyone attending even though they knew that Ernie was now better and in heaven where God can now look after him. Esther is feeling rather choked up with tears too but it is no surprise as she too had grown very close to dear Ernie. I have always, up till now, refused to countenance the idea of having a funeral in St. Hilary's. The memory of my own mother's final illness and death in November 2003 was, for a long time, too raw and painful a memory for me to cope with such an event. However time has passed and I now realise that churches must encompass ALL aspects of our lives including our earthly deaths. And so, after great encouragement from friends, the whole circle of life has been fulfilled in the life of St. Hilary's! I also have to thank Michael, a friend to my late brother, John, who died tragically in 1986, for his tribute to him which I have used here and it read "John is better now, he is being looked after". Thanks to Frances of Buttercup Miniatures for our seed tray and seed packets - they are brilliant. Thanks also to Frances for the Victorian coffin cover crochet pattern which I crocheted with her permission for inclusion on this page. Visit her website for more information on the coffin cover pattern, materials etc required. Thanks to sister Catherine of Dollshouse Heaven for making our cross shaped coffin wreath to order! See our News page for more about the wreath coffin and a link to a news article by Catherine with photo on how she actually made the wreath. 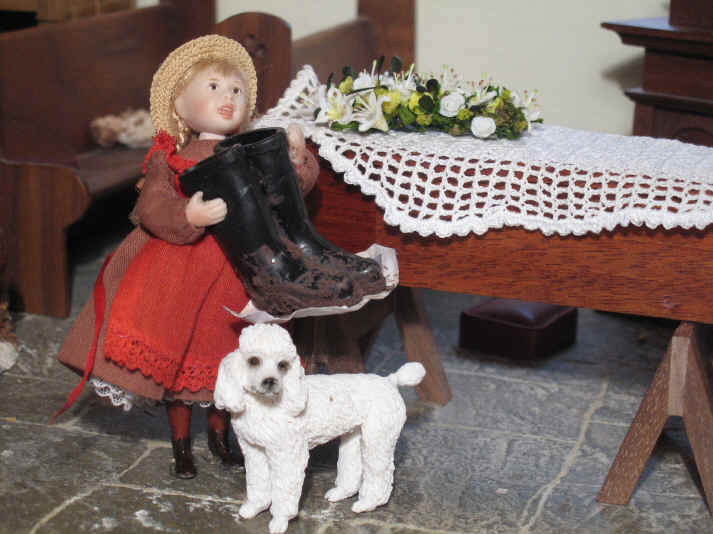 Thank you to Oak Tree Dolls House Miniatures for the muddy wellington boots on newspaper. 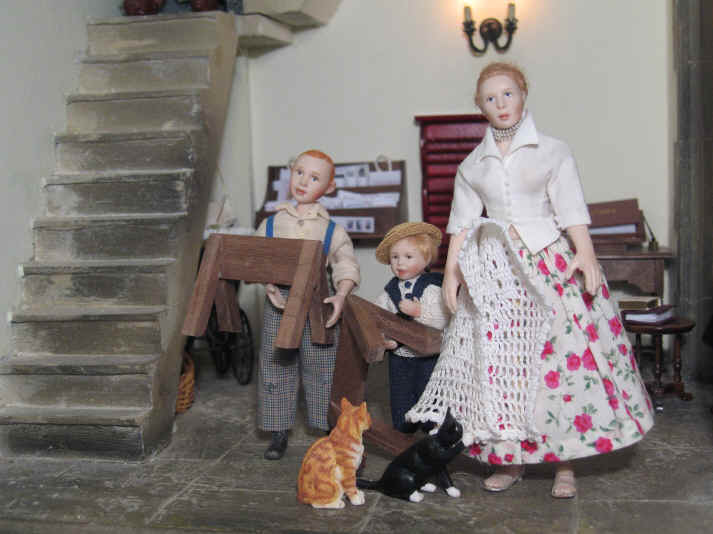 The coffin was made for us by sister Catherine from a McQueenie's Miniatures kit.